Bill Mullins wrote: Edwin S. Andrews was related (by marriage) to Louis Dalrymple. Credit to Richard Hatch for much of this research. In all my years, I never thought I'd actually see a "smoking gun" as relates to Erdnase ... and yet Richard and Bill find one! Just to clarify a couple of things from my perspective: Bill Mullins deserves all the credit for linking the Dollie Seely line with the Adelia Seeley line. While I did have access to both family sides, I never put them together, mostly owing to skepticism on my part that the Adelia Seeley parentage (Orin and Dianna) was correct. I am still not fully convinced, but Bill has made me now think it is likely correct. Also, to be honest, I was hoping for a closer relationship than "my wife is the third cousin once removed of Louis Dalrymple", which is definitely related, but arguably not so close that we can be sure the author would have known it. So while I feel this does definitely advance Edwin Summer Andrews, I don't think it can be considered a "smoking gun". Bill does have arguments that make it plausible that the Whiteside County Seelys knew the Henry County Seeleys, but I'll let him make that case. While I personally find all the candidates interesting, I will confess that I am still partial to Edwin Summer Andrews, most likely because of how I found him and how I initially became convinced that he might be the author. If he could be connected to McKinney (as is the case with both Gallaway and Benedict), that would further serve to strengthen the case for him, as would unambiguous association with expert card play (at present we only have a newspaper reference to his future wife playing cards and to him turning down an opportunity to play cards), which I think is pretty unlikely to turn up. But then, I never imagined as much information as has been developed in the past few years would add so many interesting pieces to the puzzle, so I'm still optimistic that more information may be forthcoming. I'm still hoping that somewhere out there is a copy inscribed by the author that will really be a "smoking gun". In the meantime, congratulations to Bill for advancing the discussion in a tangible direction. I personally find Peter Zenner's new candidate Edward Douglas Benedict most interesting. He was a friend of Peter's earlier candidate, Harry Thompson, and the latter had a large library. Would anyone now know how that library was disposed of? It would seem a likely repository of an author inscribed copy, if Benedict was the author. Bill does have arguments that make it plausible that the Whiteside County Seelys knew the Henry County Seeleys, but I'll let him make that case. I look forward to reading that information from Bill, especially as those two counties are literally right next door to each other, with both counties together inside a 60 mile radius. Yeah, Whiteside County and Henry County used to be one big county until 1836. Sterling and Cambridge are only about 55 miles apart by the current roads, closer "as the crow flies". Both families came from Niagara County, NY, it's possible the Adelia and her sister Emma moved there after the death of their father Orin in 1850 at the invitation of their Sterling "cousins" who had moved their earlier. All just conjecture at this point, but certainly no less plausible than some of the other speculations that have been made recently on this forum! I think it is very probable that the two branches of the family knew each other. This corner of Illinois had many settlers who originated from northern New York. Dolly's branch (Seely) showed up in 1836. Adelia's (Seeley) came only ~15 years later, possibly because their cousins had paved the way. Orin Seeley (Adelia's father) and Jeduthan Seely (Dollie's g-grandfather) were first cousins. The most likely direct connection from one branch to the other would have been through Solomon Seely (Edwin's father in law) of Sterling and George Gould (Louis Dalrymple's uncle, and brother-in-law of Adelia Seeley) of Moline. 1. Dollie's father, Solomon, was postmaster in Portland IL (Portland is half way between Sterling and Moline) in the 1850s (1851, 1857, 1859 confirmed). He'd be aware of other Seelys, Seeleys from that. From 1856 to 1859, in Moline (35 miles w of Sterling), George D. Gould was deputy postmaster. In 1861, George married Emma Seeley (Louis Dalrymple's aunt), and later became postmaster of Moline from 1865 to 1869 (and he, likewise, would have also have learned of other Seeley/Seely neighbors). 2. By the late 1800s, Solomon (who died in 1903) was essentially the oldest living Seely in the area, and the one who had been in the area the longest. He was locally famous as the son of a pioneer of the area, Col. Ebenezer Seely. He would have been the local patriarch. On the occasion of a party for his 50th wedding anniversary (in 1900), the Sterling Standard said "Everyone in this part of the state knows Uncle Sol Steely and his estimable wife." 3. Solomon ran a hotel from ~1867 - 1872 ("the Wallace house, then the leading hotel in this part of the country"), and then entered the restaurant business and stayed in it until (at least) 1900. One of his locations was a lunch counter in the railroad depot, where he would have met any other Seeleys, Dalrymples, or Goulds passing through. Per the 1880 census and other records, his restaurant at that time also included a rooming house. One of his tenants was AA Wolfersperger, who was an attorney and later became a judge. Seely's restaurant, ca. 1890s. Sterling Standard: "there is probably not a restauranteur outside of Chicago who is as well known as Uncle Sol." 4. Both men were active in fraternal organizations: Gould was a Freemason and Solomon Seely was a member of the Knights of Pythias. I've established from Sterling newspaper accounts that Sol was fairly active, and attended get-togethers that occasionally included members of other fraternal organizations. Still looking, though, for a meeting that included both KofP and Masons during the right time. 5. Both men were politically active. The postmaster jobs above were political patronage jobs. Solomon attended the Democratic National Conventions in 1888 (St. Louis) and 1892 (Chicago) and was quite active in the party at the county level. George Gould held local offices (court clerk, assessor etc.) in Rock Island County (although he was a Republican). After postmastering, his primary job was as a traveling insurance adjuster (was heavily involved in payouts from the great Chicago Fire; one of the companies he represented was Niagara Fire from New York), and may well have travelled on one of Edwin Andrews's trains early in Andrews's career (who was working on the railroad earlier than 1884, possibly way earlier, as there is a reference to him as a "peanut boy" on the trains). Gould also was an attorney, and litigated cases for his company. In addition, Louis Dalrymple's father William held offices in Henry County (he was, for example, the coroner for a while). So he may have known the Whiteside Seelys directly. 6. Like the Seely's in Whiteside County, the Goulds were big deal in Rock Island County. George's father John was a Judge, and was a founding partner in Deere, Tate, & Gould, which eventually became the John Deere tractor company. So, can I put Edwin Andrews and Louis Dalrymple together at any particular time and place? No. But it seems very likely to me that the generation before them, men who were socially, politically, and commericially important, and who travelled around in the same areas, would have known each other. They live a short train ride from each other, and the rail ran directly from one town to the other. If a Seely was heading west, he'd have passed the Goulds and Seeleys. Likewise, if Gould was going north, he'd have passed the Seelys (and may well have eaten at Sol's diner at the Sterling depot). And so when the Andrews family was in Denver, reading Puck or Judge, and Edwin would comment on one of the many drawings by Louis Dalrymple, it makes absolute sense that Dolly would say, "Oh, he's a cousin. My father knows his father and his uncle. His mom is a Seeley, you know." Generational differences taken into account, those seem to be very strong links Bill. They all essentially lived right on top of each other, at least in a regional sense. I can't help but note that Bill's research has both Dollie and Edwin as a couple who were quite serious card players. At least such that in both of their cases, a newspaper was compelled to write about their card playing specifically on two separate occasions. I actually put equal weight in the article noting Bill found noting that Andrews didn't play cards one evening, as it seems odd to write that kind of information in an article unless Andrews reputation was that he always did play cards if the opportunity were to arise. "The evening was spent in dancing and card playing"
I find it amazing that the author of the article uses the phrase "the evening was spent", and one wonders if a full evening of dancing and card playing involved not only games, but also demonstrations of skill with a deck of cards? Sorry guys, I know you're downplaying your amazing research ... but as far as I'm concerned, Bill and Richards research linking Dalrymple and Seeley as extended family [i] when taken along with the other evidence (in Chicago, deck of cards in hand, right age, right appearance, etc) is indeed (IMO) an example of a classic smoking gun. The fact that E.S. Andrews simply reverses to S.W. Erdnase is but the icing on the cake. Also the circumstances that led Richard to consider E.S. Andrews as a candidate in the first place are strongly tied to the entire story (as we know it). Andrews wasn't just somebody Richard pulled out of a hat and tried to make fit. Anyway, amazing research and it literally made my day re-reading the last dozen or so posts in this thread more than a few times over to make sure I understood the impact of Bill and Richard's findings. I certainly appreciate Roger's enthusiasm. However, I don't want to make more of these discoveries than they are. Edwin S. Andrews remains a circumstantial candidate only. If there's one thing we know about Erdnase, it was that he knew sleight of hand with cards. And we don't have that piece of the puzzle with respect to Andrews. The newspaper notes about both him and his wife show only that they played cards at a social level. The lady across the street from me has played bridge on a weekly basis for decades, and I'm sure I could fool her with color monte. Andrews isn't known to have any of the skills evidenced by Expert. While I don't think M. F. Andrews was Erdnase, the simple fact that he was known to cheat at the card table keeps him in the running, so to speak (at least until we can demonstrate that fact about one of the other serious candidates). On the other hand, I don't want to make less of these discoveries than they are, either. If there's a second thing we know about Erdnase, it was that he claimed to be related to Dalrymple. Andrews was related to Dalrymple, and even though the relationship was distant, I don't think it was unknown to him. We can't say that about any of the other candidates. In addition, he was at the right time and place, his comings and goings to and from Chicago jibe nicely with how the book was produced and sold, he mostly matches with the rest of Smith's description to Gardner, his wife had worked close to Printer's Row, possibly giving him an entry to the Chicago publishing community, and there's a good explanation for why he would used the pseudonym "S. W. Erdnase". Short of showing him to have cheated at cards or to have performed card magic, I don't see how his circumstantial case could be stronger. Unrelated: In the McKinney bankruptcy files are several references to Guy B. Seely. The Seely family was known to recycle first names of ancestors, and one of Orin Seeley's brothers was named Guy. Richard Hatch commented earlier that he did not think Orin Seeley was the father of Adelia. What has changed? Is this relationship proven by documents or is it conjecture? I will have doubts about any candidate unless he is shown to have been an experienced amateur or professional magician. Richard Kaufman wrote: I will have doubts about any candidate unless he is shown to have been an experienced amateur or professional magician. I agree Richard, with a minor modification. If one believes (as I do) that Erdnase wrote the EATCT without the assistance of any other writers, then his being at the very least a scholar of card magic would be mandatory. I think looking for a "Magician" may be a bit too broad, if indeed Erdnase was only interested in playing cards, and used his deft card handling as an entertainment for family and friends in order to better explain his actual skill as a card hustler. Every bit of additional evidence that any candidate handled playing cards is a very obvious benefit, but that all has to begin by putting a single deck of cards in the candidates hands to begin with. Bill has demonstrated that E.S.A. was associated with playing cards in such a notorious fashion that the night E.S.A. didn't show up to an evening of card play, the local newspaper thought it a unique enough occurrence to mention in an article. lybrary wrote: Richard Hatch commented earlier that he did not think Orin Seeley was the father of Adelia. What has changed? Is this relationship proven by documents or is it conjecture? I knew about the Orin & Dianna Seeley conjecture for Adelia's parentage since at least October 2012 (five years ago) when I engaged in email with family members who had posted online regarding it, asking for clarification, since it didn't agree with what I thought I knew about her. The limited responses I received at that time did not convince me, and I didn't pursue it further. My problem was that I knew that Adelia M. Seeley had a sister Emma F. Seeley who lived in her home in Illinois in 1860 (listed in the 1860 census with William L. Dalrymple and his wife Adelia, Emma's last named is spelled Seelye and she is listed as a "spinster") and the Orin Seeley records did not include Emma or Adelia, as best I could tell. The 1850 census (Orin's last, since he died later that year) does include a 9 year old "Emmeline" as one of his daughters, and that could be Emma, though at that time I thought she was older and it unlikely for the age at that point to be in error. There is no one matching Adelia in that household, who would have been mostly likely 10-13 years old then. Bill Mullins has found a source published during Emma's lifetime that gives her father's name as "Orin Seeley, of Niagara County, NY" (you can find the citation here with info about her husband George D. Gould's grave: https://www.findagrave.com/cgi-bin/fg.cgi?page=gr&GRid=29979444). The question then became whether there might have been another "Orin Seeley" from Niagara County, NY who had at least two daughters, both born around 1840 in Niagara County, one named Emma and the other Adelia. No such person has yet been found. To complicate matters, Bill has found Emma F. Seeley Gould's death certificate (from Detroit 1906) and it lists her father's first name as "Eben". That was exciting to me, as there is an "Ebenezer Seely" who was Dollie's grandfather, which would have made Adelia Dollie's aunt, but we can rule out that particular Eben Seely as he was in Illinois by the mid 1830s and all his children (which do not include an Emma or Adelia) were born in Illinois. According to a handwritten document in a Seeley family scrapbook, Orin's brother Ebenezer helped his illiterate widow Dianna with the estate after his death. I have been unable to identify that Ebenezer, and Bill has pointed out to me that Emma's death certificate was filled out by the undertaker, not a family member and is more likely to be in error than the source published during her lifetime (indeed, the death certificate has her mother listed simply as "Mrs. Seeley". Accurate, most likely, but not helpful). Bill has also been able to find an obituary for Adelia Seeley (Bill is incredible in his research ability!) and it does not give her parents' names. She died in Deming, New Mexico in 1904 and New Mexico did not register death certificates, so that appears to be a dead end. So, while the "Orin and Dianna Seeley" parentage is not entirely proven, I do accept it as most likely at this point. Of course, I'd prefer it to be another Orin or Ebenezer Seeley, more closely related to the Whiteside Seelys. In the apparently unlikely case it is Orin's brother Ebenezer, that doesn't change the relationship Bill has established with his current research. Any professional (or amateur) genealogists out there who care to investigate? Both Bill and I would welcome any help! In other words there is currently no proof that Orin is Adelia's father. What about the relationship of David Seelye to Ebenezer and Jeduthan? Are there documents to proof them? To elaborate: For the most part, searching for Adelia's parents had not, to date, proven successful. Richard has mentioned several times over the years here in this thread that she had a sister, and the family was likely from Niagara County. The only direct evidence I knew of was the 1860 census that listed "Emma Seelye". So I started searching for that name, and variants (Emma Seely, Emma Seelye, Emma Seeley), and came across this page, which linked Emma to George D. Gould and to her father, Orin Seeley. The book is contemporaneous, printed in 1885, a year before Gould died, and about 20 years before Emma died. I take this as documentation that Emma's father was Orin. "Mrs. G. D. Gould and her son Clyde, and neice, [sic] Miss Minnie Dalrymple, left this morning for a visit to Battle Creek, Mich."
"Mrs. Kitty Byron, and Mrs. Wm. Dalrymple and Miss Minnie Dalrymple are in the city visiting Mrs. George Gould. Mrs. Byron is on her way to her home in New Mexico." Minnie is known from census records to be Louis's sister. If she was Mrs. Gould's niece, then Emma Gould was Adelia's sister. Add in the geographic proximity of Moline and Cambridge, and that Kitty Byron was another daughter of Adelia, and the relationships are established. Like Richard alluded to above, the statement that Emma's father's name as listed on her Death Certificate was "Eben" (Ebenezer) was just wrong. Background: Emma's daughter Ruth had married Don Jewett in Ann Arbor MI in 1897. Jewett was from Detroit. They divorced in Aug 1901 (An infant child of theirs had died in Nov 1899, possibly straining the marriage. The listed cause was "extreme cruelty".) Emma moved to Detroit sometime around then (she does not show up in the Jewett household in the 1900 census, and is not in the 1901 Detroit city directory, but is in the 1903 and 1904 volumes). After the divorce, Ruth moved to New York City, leaving mother Emma behind. So when she dies, no one one with first-hand knowledge of her family is available to inform the Death Certificate, and the job falls to C. A. Blake, who was an undertaker, who simply doesn't know. TL;DR -- a contemporary, well-researched book shows that Adelia and Emma's father was Orin Seeley of Niagara County; a later document, put together without direct knowledge and after the principals have died, says it was Eben. Conclusion: Adelia and Emma's father was Orin Seeley, who appears in the 1850 census, living in Niagara County, NY. And the Shotwell family scrapbook that is mentioned online only tends to confirm this. Chris asks about the chain from David Seeley to Ebenezer and Jeduthan. Jeduthan's father is listed as Ebenezer here and elsewhere. Ebenezer is listed as a son of David in genealogies published by the Seeley Genealogical Society. See here, for example, where they trace the male line of Seelys backwards as (Jeduthan/Juduthen; Ebenezer, David; John; Benjamin; Nathaniel; Robert) to Robert Seeley, who came to America in the 1600s. (and yes, I have checked to make sure that the Jeduthan; Ebenezer; David listed above are the same ones as I have in the Family Tree I linked to previously). Smith remembered that Erdnase said he was related to Louis Dalrymple. Even if your tree is correct, E.S. Andrews was not related to Louis Dalrymple, his wife was. So Erdnase would have said "my wife is related to Dalrymple", which is not what Smith remembered. Richard Hatch's own standard was "up to 2nd cousin". This tree makes Dollie the "3rd cousin once removed" hardly a relationship she would have known. Layers upon layers of assumptions. We have to assume Smith's memory 45 years later was correct, but not too correct because it was the wife who was related not Erdnase. We have to assume the family tree as drawn is correct. We have to assume Dollie knew the relationship to her 3rd cousin once removed. We have to assume she mentioned this to Edwin. We have to assume that this relationship was meaningful enough for him to mention it to Smith. Wow! And you are the first to call out the assumptions of others. lybrary wrote: Smith remembered that Erdnase said he was related to Louis Dalrymple. Even if your tree is correct, E.S. Andrews was not related to Louis Dalrymple, his wife was. So Erdnase would have said "my wife is related to Dalrymple", which is not what Smith remembered. Richard Hatch's own standard was "up to 2nd cousin". This tree makes Dollie the "3rd cousin once removed" hardly a relationship she would have known. "Related by marriage" is a real thing, Chris. For example, in response to court orders over the president's second travel ban, the government determined that some foreign in-laws have a "close family relationship" to American citizens. The phrase "related by marriage" can easily be found in the Library of Congress's "Chronicling America" newspaper database back into the 1830s. Every family reunion I've ever been to included in-laws. When you say "Erdnase would have said 'my wife is related to Dalrymple,'" you don't know that -- you have no idea what his own definition of "related" was, or if it would have included in-laws. But for a native speaker of conversational English, particularly one making small talk with an artist he just hired, Andrews claiming that Dalrymple was a relative is perfectly fine. As for whether or not Andrews would have had knowledge that he was related to Dalrymple, I've laid out my case. You can believe it or not, but I bet it gathers more traction than, for example, the idea that Edward Gallaway was a magician. Layers upon layers of assumptions. Let's go through a recent book, entitled The Hunt for Erdnase (version 10/4/2017). p. 35 "Bottom line is that we have to assume"
p. 38 "If we assume"
p. 38 "which is a fairly safe assumption,"
p. 39 "We can therefore assume"
p. 58 "If we conservatively assume"
p. 92 "If we assume this is correct"
p. 97 "We therefore have to assume"
p. 105 "With Smith we have to assume"
p. 105 "It is not hard to assume"
p. 109 "we can assume"
p. 109 "Since we can assume"
p. 145 "which we can assume"
You really don't have much room to make that particular criticism. lybrary wrote: Smith remembered that Erdnase said he was related to Louis Dalrymple. Even if your tree is correct, E.S. Andrews was not related to Louis Dalrymple, his wife was.... This tree makes Dollie the "3rd cousin once removed" hardly a relationship she would have known. Most people like to be related to kings and queens; not horse thieves and panhandlers. If Erdnase felt Smith would have been impressed by the Dalrymple connection he very likely would have claimed Dalrymple as a relative. He would not have offered information to reduce the status of that relationship. In my own case I'm related to J.P. Morgan. Please don't ask for money. The relationship is very distant and on my wife's side of the family. Regardless, in the United States and Canada, when one marries, it's very common, if not highly traditional that each spouse assumes the relatives of the other as their own - this both figuratively and in regular conversation. My dad called my mum's mother "Mum", and I reference my wife's sisters, my first cousins, and the children of my first cousin as "my cousins". I also reference the children of my first cousins children as "my cousins", and indeed ensure that they're all invited to regular family gatherings in the region we all live in. For his entire life, I referred to my Dad's step-uncle as "Uncle Les", and I was taught to consider all of his children (far older than I) as "my cousins". I'm sure I'm far from unique in considering my own and my spouses distant family as "relatives", mainly because that's exactly what they are. Chris, you are big on deferring to "experts". David Murray Schneider's field of expertise was the study of kinship. In his book American Kinship: A Cultural Account, he said ""Relative" is used to include both relatives by blood and by marriage . . ."
I'm very impressed with the amount of researching done by the individuals posting, I wouldn't have a clue where to begin. Will have to say I'm glad Bill clarified the card playing reference. Have to believe that card playing was a common practice to pass the time and socialize. Richard K, you mentioned in a post about another candidate (can't seem to find it), was that Peter Zenner's, or is there yet another? Smith only remembers one meeting with Erdnase even though he must have met him more than once. Smith does not recognize his own drawings. Smith only remembers making 20-30 drawings not 101. This is his own work. He must have spent hours drawing and inking his illustrations yet he doesn't even recognize them. It is proof that there are major gaps and errors in his recollections. But you assume that he perfectly and accurately remembered an off-hand comment and the name Dalrymple, when Smith himself admits he is bad with names. You gotta be kidding! If Smith's memory is so bad, you shouldn't take advantage of his recollections when they tend to comport with Gallaway. lybrary wrote: Smith only remembers one meeting with Erdnase even though he must have met him more than once. Actually, Gardners quote is "Although Smith must have seen him on several occasions, he can recall only one meeting, but that one he recalls vividly". Smith has no problems recalling the meeting we're discussing in this thread. Smith does not recognize his own drawings. Actually, Gardner tells us too that Smith recalled he sketched Erdnase's hands in pencil, and then took them home to ink them in. Gardner also tells us that Smith recalls that Erdnase had to O.K. each drawing. In order to make these recollections, Smith would obviously have to recognize his drawings. Smith only remembers making 20-30 drawings not 101. A question answered in great detail earlier in this thread by somebody who would know, Earle Oakes. It has also been addressed by other researchers, also documented in this thread. it is proof that there are major gaps and errors in his recollections. Rigorous questioning of a candidate is a good thing, but this isn't a rigorous question, it's an unnecessary platitude. My Erdnase is better than your Erdnase. Bill Mullins wrote: If Smith's memory is so bad, you shouldn't take advantage of his recollections when they tend to comport with Gallaway. I don't. For me the facts surrounding the book are the most important. The book is printed black on white. There are no memories or recollections necessary. Erdnase writes very eloquently, rich vocabulary, colorful expressions, very detailed descriptions of moves. Ask yourself who could have written such a book? Who has the necessary writing experience? Who has the necessary self-publishing profile? E.S. Andrews: Zero writing of any substance we know of. No profile to support writing or self-publishing. M.F. Andrews: Alibi note clearly demonstrates he can't be the author. Gardner and Busby had to explain it away with an 'editor'. W.E. Sanders: On the surface he does have education and writing experience. But his writing is bland, plain, engineering like. Has never self-published nor written an entire book himself. Only engineering articles and contributions to books. Nowhere the eloquence of Erdnase. Forget about what Smith said. Half of it is likely wrong anyway. Show me that your candidate has the same writing ability as Erdnase. That is the only objective comparison and identification one can make. You spend a whole chapter (4. Physical Appearance) in your ebook going through Smith's recollections and trying to show that Gallaway matches them. You mention magic "books" (plural) more than once in the ebook. What are they? The only one we know about is Expert. Why do you think he had "books"? Forget about what Smith said. Half of it is likely wrong anyway. This, from the author who said, after discounting only Smith's recollections of names, "On the other hand many of Smith’s other recollections, which are unique to his encounter with Erdnase, are very likely correct, because there is little chance that these may have been changed by other similar facts over time." Wow, a whole chapter out of 23 chapters. Of course, I have to address it in the book, because if I don't, then people like you will complain that I don't address it. It was simply to show that Gallaway generally fits Smith's description, but it is not a main part nor an important part of my book or my thesis that Gallaway is Erdnase. And that is what we are talking about the last days. The name Dalrymple. A general note: if respected magic historians found Chris W.’s evidence and conclusions convincing, there’d be considerable more buzz at large in that community. But there isn’t. Of course, that says nothing about the actual merit of Gallaway as a candidate, but to some degree I think it does speak to the widespread perception of the weakness in Chris’ theory. When Gutenberg invented metal movable type his intention was to mimic as closely as possible the beautiful handwritten bibles. … to do that he created characters of different width. For example, he had several different 'm' each just a bit narrower than the one before. So when a line was just a bit too long he could take some of the m characters and exchange them with narrower versions to achieve lines of text with exactly the same size. Chris, are you suggesting that Gutenberg actually created type punches for, and thus cast varying widths of, multiple letters within a certain fount? If so, I’d like to know your source for that claim. On the other hand, if you are saying that Gutenberg may have filed off some width on the body of a cast type piece to give him kerning flexibility, I suppose that may be possible, but would also be curious about your source for this. Yes, characters do generally occupy a fixed rectangular space, but from that it would be erroneous to conclude that it was therefore impossible to set an ‘a’ slightly under the ‘T’ crossbar. One could shave the width of both the ‘T’ and ‘a’ type bodies to achieve this, and for some of the more “exotic” alphabets (such as Greek), certain letters are cast where the face is considerably wider than the shoulder, which then allows different accents to be used with such letters. Chris Wasshuber wrote: … what I am claiming is that the reverse italic 'a' was a typesetter technique to produce a better looking title on the cover. … It is not a hidden code. It simply looks a bit better this way. Well, if the purpose of the “reverse italic” ‘a’ was kerning, the designer failed. The spaces on either side of the ‘a’ are very similar (if not the same). The backward-slanted ‘a’ draws considerable attention to the eye of the reader, which is definitely not the purpose of kerning. Absent designer error (unlikely given the relative rarity of “reverse italic” uses), it seem like the designer specifically wanted this ‘a’ to be a distinctive feature of the title. Roger M. wrote: Bill has demonstrated that E.S.A. was associated with playing cards in such a notorious fashion that the night E.S.A. didn't show up to an evening of card play, the local newspaper thought it a unique enough occurrence to mention in an article. Roger, one branch of my family ran in the “higher” social circles in the late 19th and early 20th centuries, and in researching the family members in that branch, I’ve come across many newspaper accounts of social functions they hosted or attended. We’ll likely never know what the writer intended, but my sense is that it was merely part of the extremely detailed “who was there and what were they doing” approach to descriptions of social activities (very common in those days). So without more I’d attach little significance to the mention of Andrews’ absence. I wouldn't for a second disagree with you Clay, mainly because I've been long convinced that playing cards in 1902 were a far more common form of social gathering and entertainment than they are in 2017, to the point where there was likely one or two decks of cards in every home, with folks in 1902 having a far more comprehensive understanding of various and assorted card games than we'd find in the average internet savvy home today. But what is different is that the article implies that Andrews saying he had to deal with some "Pippins" in order to avoid a card game was couched as if it was somewhat of a common occurrence ... which by extension implies not just that he didn't play on the one night being referred to in the article, but by extension he must have played very often, at least often enough such that Andrews "Pippins" excuse became a matter of some humor among his fellow card players for those times when Andrews wanted (or needed) to get out of a card game. But specifically, what it absolutely does is puts a deck of cards in Andrews hands, which would, to me, be the important part. Chris Wasshuber wrote: When Gutenberg invented metal movable type his intention was to mimic as closely as possible the beautiful handwritten bibles. … to do that he created characters of different width. 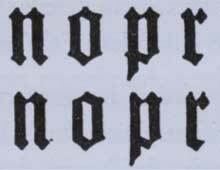 For example, he had several different 'm' each just a bit narrower than the one before. So when a line was just a bit too long he could take some of the m characters and exchange them with narrower versions to achieve lines of text with exactly the same size. Note how the "diamonds" are missing from the left sides of the letters on the lower line. Whether this is a result of an intentional modification of a cast piece of type, or variations in the manual process of filling a mold with molten type metal and removing the cast letter, seems to be disputed by modern scholars (at least, within my quick-and-dirty web searching). When Gutenberg right-justified lines, he mostly did it by adjusting the spaces between words. See how the spacing between words in the 3rd and 6th lines is obviously greater than the spacing in the others. See how the period in the first line has a non-standard space in it, and how one of the colons is preceded by a space, and one isn't. lybrary wrote: W.E. Sanders: On the surface he does have education and writing experience. But his writing is bland, plain, engineering like. Has never self-published nor written an entire book himself. Only engineering articles and contributions to books. Nowhere the eloquence of Erdnase. From 1899 on, W.E. wrote and published, under his own name, approximately 42 pages of poetry and 202 pages of prose that range from histories and biographies to technical essays, public reports, and patents. His college theses runs to 219 pages, and he filed an uncounted number of reports for the mining companies that employed him later in life. His surviving diaries are scattered throughout 12 volumes. What is interesting when looking at this body of work is how diverse both the subjects and the styles are. Whatever he decided to understand, whether it was etymology or regional history, W.E. tackled his subjects with comprehensive attention...And W.E. was not merely a journeyman writer. He was an expert who knew how to vary his text to suit his subject and his audience. When writing for mining engineers, he was exact and unspeculative...When he discoursed on the history of Montana, he was grandiloquent and classical, delivering an oration inspired by Livy. And when he wrote of his college friends, he was sarcastic and playful, using slang, humor, and dialect. When he wanted to, W.E. Sanders could write as stylishly and cleverly as S.W. Erdnase--or as he put it in a letter to his parents, "in my own and inimitable facetious style." Both authors tend to express wry sarcasm by injecting a question mark into a sentence. "The hypocritical cant of reformed (?) gamblers, or whining mealymouthed pretensions of piety..." and "...when the careless dealer (?) turns to expectorate..." are samples provided by Erdnase. W.E. wrote We were fed fit for princes (?) stuffed veal without the veal..." and "...I am becoming quite a professional (?) cuisiner." If anybody can pull together a portfolio of W.E. Sanders writings I am more than happy to include it in my ongoing textual analysis. I do have parts of his diaries and two of his mine timbering articles. These do not show any eloquence on the level of Erdnase, neither do they show similarity in a statistically significant number of linguistic features. Sanders was class poet for the 25th reunion of his Mining Engineering class of Columbia, 1885. As such, he was tasked with writing a poem for the event. With its mishtherus hyrogliffs "G.S., M.P., G.R." And p.d.q. it catches me -- there is no chance to shirk. So I must corrugate me brow and get me down to work. (The only fun about it is that you too have to serve). Amuse the musing miners with the music of my muse. And make you wish you ne'er had sent that tellygraft, I swear! And on you, gathered at the feast, my benedictions pour. For you and for the absent ones in mem'ry fondly stored. God bless and keep you, one and all, my dear and cherished friends. Not particularly plain, nor bland. Note the polysyllabic words, the French words, the alliteration, the eye-dialect -- all linguistic features that exist in Expert and have been commented on and noted. I don’t know whether the discussion of kerning and Gutenberg were essential in this context, but I am in full agreement with Chris’s statement that . . .
Well, maybe not in full agreement. I actually do not believe that the cover lettering was set in type. I think an artist hand-lettered the original art, and that a die was made from that art. None of the duplicated letters (such as the multiple examples of “e” and “a”) necessarily appear to me to be identical with any of the others. As to the “acorns,” or whatever they are, they do not look demonstrably identical to me, and originally they also may have been hand drawn. That general style of type was quite popular with The Publishers’ Weekly back in (for example) 1902, and many, many examples can be seen there on Google Books. It appears to be evidence of a design philosophy which, consistent with what Clay said on this topic, is not directly related to kerning, ligatures, or letter-spacing. The letter “a” is not the only one that occasionally received special treatment. One may find stretched-out examples of “u,” “n,” “h,” and maybe other letters as well. This general topic was alluded to by “mam” in a September 14, 2015, post, and I went into it in a little detail in the post that followed that. Of particular interest was the fact that mam’s post referred to that style being used in an advertisement for Jamieson-Higgins Co. Here is a link to mam’s post just referred to: Link. I think the Jamieson-Higgins link in mam’s post does not work. Roger M. wrote: But specifically, what it absolutely does is puts a deck of cards in Andrews hands, which would, to me, be the important part. Bill, please remember the context of my comment: Chris was essentially claiming that Gutenberg purposefully cast and used varying widths of typefaces (or possibly narrower shanks) as a means to achieve fully justified lines of text on each page. The point was that I doubt such claim has any basis in fact, and am not sure how your comments are relevant to my point; for example, even assuming that the missing serifs (“diamonds,” as you say) are an intended result of Gutenberg’s casting – almost certainly not the case – such minute differences in width would have zero utility as type-spacing and justification tools. That illustration really only demonstrates the end-result vagaries in the processes of type creation and printing in the hand-press era. There are many reasons why, without any intent to do so on the part of the craftsmen involved, the letters would look different on the printed page. If you’ve found an authority who specifically claims that the minute differences shown in that illustration (or between other letters) were intended by Gutenberg, or have typographical significance (other than as evidence of how the letters were manufactured), I’d be very interested in reading his/her paper. Sometimes I wonder if the magic community should hire an outside private detective agency to investigate this matter. Comparing a poem to prose makes no sense. Erdnase didn't write his book in verse. Two completely different genres. The remarkable thing with Erdnase is that he wrote a highly technical book very eloquently. Show me a technical article by Sanders that displays that kind of eloquence. Gallway's books are also very technical, yet he displays similar eloquence, word and phrase usage. magicam wrote: If you’ve found an authority who specifically claims that the minute differences shown in that illustration (or between other letters) were intended by Gutenberg, or have typographical significance (other than as evidence of how the letters were manufactured), I’d be very interested in reading his/her paper. Clay -- I had hoped that the next paragraph in my post, the first one that you didn't include in your quote of me above, showed that I too am skeptical of Chris's claims about adjusting the spacing of lines by varying character widths in the Gutenberg Bible. Such papers exist (see p. 25: "The second method to adjust lines was the use of multiple variants of glyphs for some letters . . . a letter in his composition could be typeset using several variants of a glyph with different width, depending on the requirements of typesetting a line. . . The multiple glyphs might also have been used for the adjustment of line width. However, this seems to be a minor effect.") Every one I've seen, however, refers back to the work of typeface designer Hermann Zapf, where he described techniques used in his hz computer program to adjust line spacing, which may be the source of the statement. ("How could Gutenberg get those even grey areas in his two columns without disturbingly wide holes between the words? His secret: the master achieved this perfection by using several characters with different widths,"). None of them, however, actually show examples of variants of a character taking up different amounts of space in a line in the Gutenberg Bible. It may be that Zapf was wrong, but he is so respected in the typography community that his statements were uncritically accepted as gospel, and propagated from there (see wikipedia, for example). (Certainly, there are typographers who are skeptical of what he said.) Or it may be that he (and Chris) were/are correct. I'm looking for earlier statement by others, and possible examples of it happening in the Gutenberg Bible. It looks to me that Gutenberg adjusted his line spacings by careful addition of blank space internal to lines, by replacing letter pairs with ligatures, and by replacing certain words with abbreviations. To the extent a particular letter may have had varying widths, it doesn't seem to me that this feature was so strong that it would have been a useful tool for solving problems in designing the lines. lybrary wrote: Comparing a poem to prose makes no sense. Erdnase didn't write his book in verse. Two completely different genres. The remarkable thing with Erdnase is that he wrote a highly technical book very eloquently. Show me a technical article by Sanders that displays that kind of eloquence. Gallway's books are also very technical, yet he displays similar eloquence, word and phrase usage. Chris -- you said that the writing of Sanders was plain and bland and not eloquent. I gave a counter-example. If the fact that a single author can write in multiple styles such that one cannot be compared to the others, doesn't that call into question the whole field of author attribution? Further, the "highly technical" parts of Expert aren't all that eloquent. The parts where the language stands out are the introduction, the patter, and those where he talks about how a card player should act. Likewise, the highly technical parts of Gallaway's books have more pedestrian language. If you want to compare flowery language to flowery language, you can't just compare the technical parts. You have to compare passages that lend themselves to expressive writing. In the case of Sanders, that isn't his mine-timbering articles. If we limited our examination of Gallaway to his most technical writing, such as his Problems in Estimating or How to Price Job Printing Properly, no one would have ever even considered him to have written like Erdnase. Bill Mullins wrote: Chris -- you said that the writing of Sanders was plain and bland and not eloquent. I gave a counter-example. No it does not. Authorship attribution does not work across genres, but it works well within genre. You cannot take a poem and compare it to prose and hope to identify an author. But you can take two samples of prose or two samples of poetry to conduct an authorship test. Bill Mullins wrote: Further, the "highly technical" parts of Expert aren't all that eloquent. The parts where the language stands out are the introduction, the patter, and those where he talks about how a card player should act. Likewise, the highly technical parts of Gallaway's books have more pedestrian language. If you want to compare flowery language to flowery language, you can't just compare the technical parts. You have to compare passages that lend themselves to expressive writing. You are making my case. It is true, the level of eloquence, and colorful expressions, is not uniform throughout the book. Both Erdnase and Gallaway exhibit their most colorful expressions in the prefaces and introductions. But also their very technical parts exhibit a similar attention to detail, command and clarity of language. Both are great in explaining technical stuff. Bill Mullins wrote: If we limited our examination of Gallaway to his most technical writing, such as his Problems in Estimating or How to Price Job Printing Properly, no one would have ever even considered him to have written like Erdnase. "There is not a “catch” in any problem in this book ..."
"In some of the problems there are “stunts” which may seem unfair to the student ..."
"The student who gets help in the solution of any problem in this book, or who copies his answers from others, is deceiving no one but himself." "They do not represent the inflated price of the idealist who preaches one price during convention week and then goes out and sells his product at any price he can get for it." "...bringing the amount to an even figure and avoiding the split nickel"
"His lack of suitable equipment is no fault of his customer—that is his hard luck." When Erdnase shifted from his general prose in EATCT to highly technical descriptions of moves, he left any and all semblance of "eloquence" behind. His assorted descriptions of in-jogs and out-jogs are, if anything, highly workmanlike - to the point where, by removing all airs of eloquence, Erdnase was able to effectively communicate complex chunks of information without any additional or wordy baggage. In Erdnase's somewhat legendary (and lengthy) descriptions of under-cuts, in-jogs, shuffling-off, etc he often intersperses some additional prose to assist the reader in understanding the somewhat dense preceding text describing method. These passages are not remotely "eloquent" in their assembly, and read very differently from his more subjective (and highly eloquent) passages seen in the introduction, or the various sections like uniformity of action, display of ability, etc. Simply put, EATCT contains more than its share of very pedestrian prose. That pedestrian prose is very effective in communicating highly technical concepts, but it is nothing that would be remotely considered "eloquent". Our Mr. Erdnase could quickly switch up writing very eloquent prose, or highly pedestrian prose, and do so at will. If Erdnase wrote anything else besides EATCT, the evidence shows that it could be very pedestrian in its prose, or it could be highly eloquent in its prose. Erdnase demonstrates deftness with both styles, and does so very clearly in EATCT. Astute readers of this thread would be wise to take a moment when reading comments like "you're making my point", or "not true at all", or any other definitive statements made by posters to this thread, and take that moment to examine whether the comment being made is true or false. One will often find that a comment like "you're making my point" is, in fact not making the original posters point at all. ...or similarly find that the statement "not true at all" is in response to a comment or statement that is, in fact, 100% true. As the thread occasionally wanders into the territory of folks vigorously defending their previous comments or statements, it can also begin to require a much more rigorous reading of what folks are actually posting. Like any well versed lawyer, when a poster shifts into defensive (or offensive, depending on your perspective) mode, much of what is written will be to attempt to lead the reader in a direction opposite the direction of where the facts would otherwise take them.